Every complex human tool, from the first spear to latest smartphone, has contained multiple materials wedged, tied, screwed, glued or soldered together. But the next generation of tools, from autonomous squishy robots to flexible wearables, will be soft. Combining multiple soft materials into a complex machine requires an entirely new toolbox — after all, there's no such thing as a soft screw. Current methods to combine soft materials are limited, relying on glues or surface treatments that can restrict the manufacturing process. For example, it doesn't make much sense to apply glue or perform surface treatment before each drop of ink falls off during a 3D printing session. But now, researchers from the Harvard John A. Paulson School of Engineering and Applied Sciences (SEAS) have developed a new method to chemically bond multiple soft materials independent of the manufacturing process. In principle, the method can be applied in any manufacturing processes, including but 3D printing and coating. This technique opens door to manufacturing more complex soft machines. The researchers focused on the two most-used building blocks for soft devices, hydrogels (conductors) and elastomers (insulators). To combine the materials, the team mixed chemical coupling agents into the precursors of both hydrogels and elastomers. The coupling agents look like molecular hands with small tails. As the precursors form into material networks, the tail of the coupling agents attaches to the polymer networks, while the hand remains open. When the hydrogel and elastomer are combined in the manufacturing process, the free hands reach across the material boundary and shake, creating chemical bonds between the two materials. The timing of the "handshake" can be tuned by multiple factors such as temperature and catalysts, allowing different amounts of manufacturing time before bonding happens. 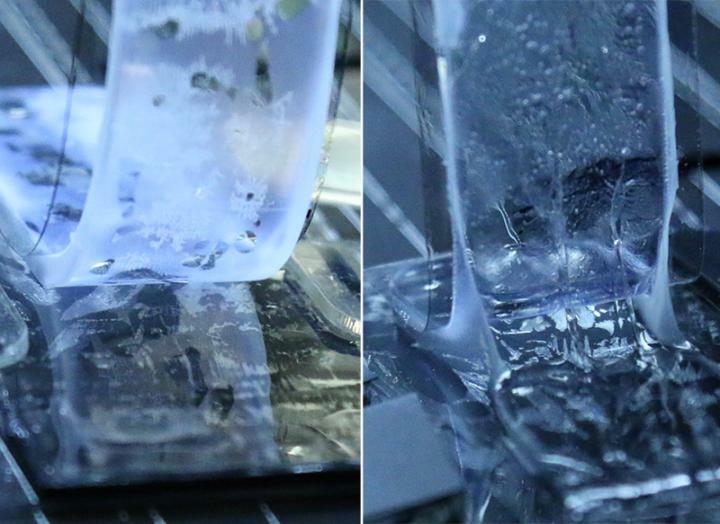 The researchers also demonstrated that hydrogels — which as the name implies are mostly water — can be made heat resistant in high temperatures using a bonded coating, extending the temperature range that hydrogel-based device can be used. For example, a hydrogel-based wearable device can now be ironed without boiling.